The Maremma is a breed of Sheepdog that originated in Italy where it has been used for many centuries as a flock guardian for sheep and goats. The breed was first imported into the United States in the early 1970’s. 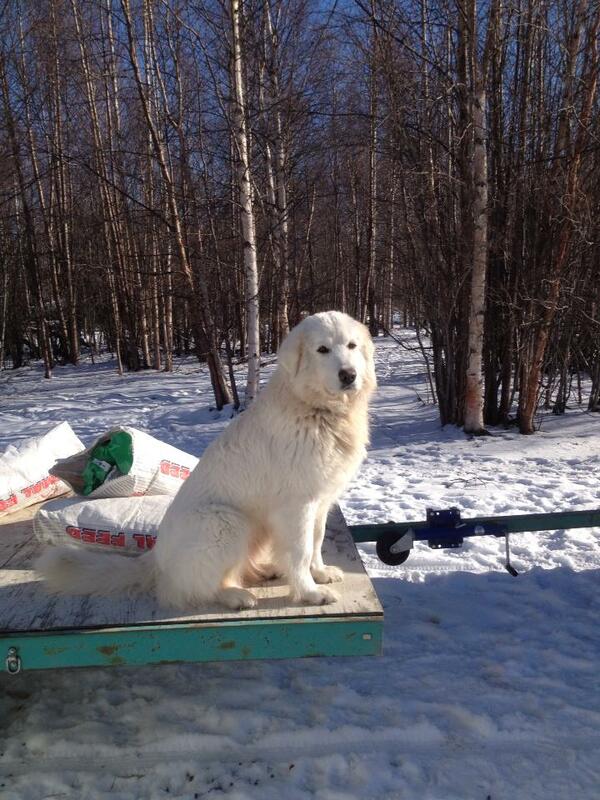 Since then, the Maremma Sheepdog has continued to increase in number and popularity. 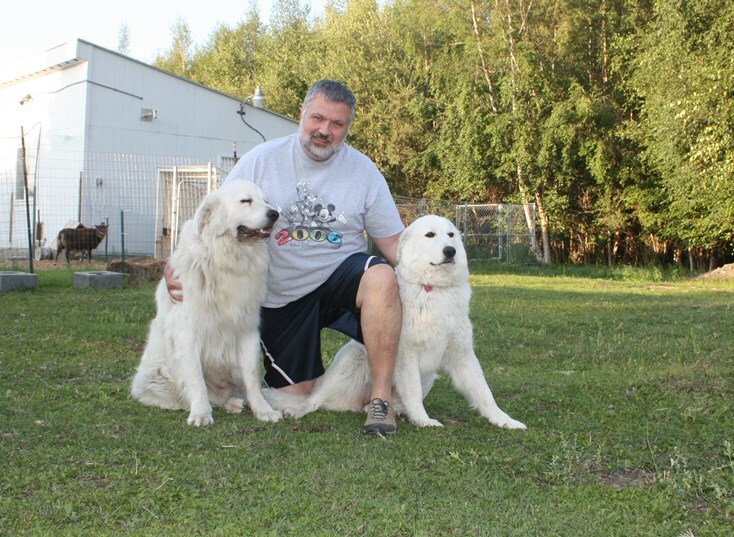 Maremmas are Livestock Guardian Dogs or LGDs for short, dogs who’s purpose is to protect their flocks from predators like wolves, coyotes, bears and raptors. Our Maremmas are really much smarter than we are. They speak sheep and horse and human! I am amazed every day at their intuitive relationship with the other animals. Mia seems to read my mind and acts before I can even voice my wishes. She is a gentle nurturing guardian who even grooms her sheep, using her teeth to delicately remove twigs and thorny branches that get caught in the fleece. It’s fascinating to watch. However cute and fluffy they look their main job is guardian and it’s a job they take very seriously. Even as pups, they practice and play at driving off predators and fighting, should the need arise. Sometimes the play can get really rough and pretty loud, but it is all part of how they train each other. They never ever act aggressive around their sheep. 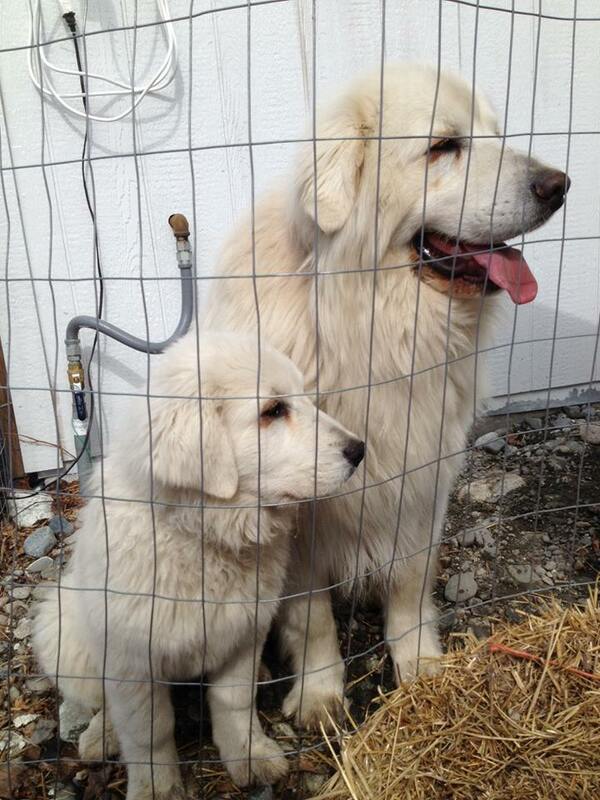 Maremma Sheepdogs are NOT herding dogs and never run at or chase their flock like Border Collies. Ours just wander in the vicinity of the sheep, acting slightly disinterested so they sheep don’t feel threatened. If we get a new sheep who is not used to big dogs our female knows how to help them relax and uses her posture and body language to calm them. By turning away she is being submissive, showing them she will not attack. 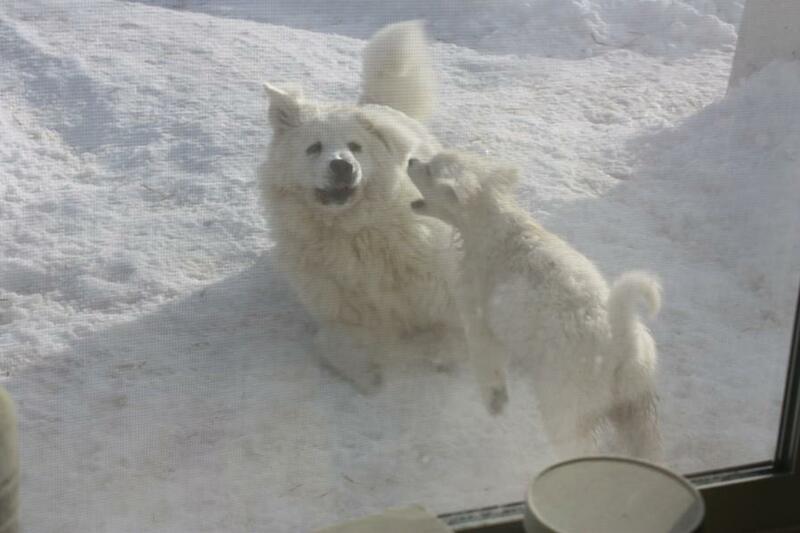 Mia and Al gave us their first litter of adorable pups in 2013. Here they are on their first trip to the vet at 8 weeks old. Part of their job as parents is to teach their offspring what it means to guard the stock. These dogs learn by example. They watch and copy everything. LGD puppies stay with their parents longer than other dog breeds. They stay to learn from their parents. They watch and mimic everything their parents do. Pups are not left alone with stock but they are supervised with stock daily to reinforce what Al and Mia have taught them. Seeing their amazing instincts kick in is completely awesome. 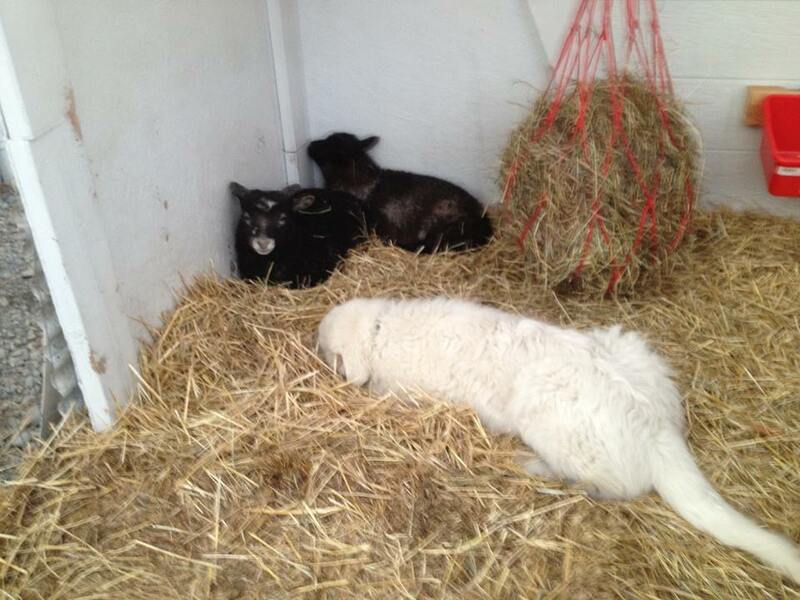 The pup should be low and calm so as not to startle the lambs. I don’t know what I did before I got these amazing dogs, I cannot imagine working without them. It’s such a pleasure to see this beautiful girl waiting to greet me. It isn’t common to see maremmas in Alaska- so I wanted to reach out and chat!! I have been trying to track down my female maremmas bloodline. Would you be able to tell me a little about your dogs and where they came from? If your dog is microchipped I can tell you if it came from our farm. All our pups are chipped before they leave us. If it is one of ours I will happily tell you all I can and then some 🙂 we do love our Maremmas! Hi there, I am in Alaska and am interested in getting a Marenna, do you have any for sale?? I am in wasilla. We are waiting to confirm a litter that should be due around the end of the month. Please keep in touch and watch the blog for more updates. You can reach me via email at TowerRanchAlaska@gmail.com or my cell 907-354-4184. Hi, I was wondering when you will be having puppies again? We will not have another litter until Springtime. The 8 week old pups are so cute! How’d you get them together like that? HI Grace, those pups were born here and we were on our way to the vet. 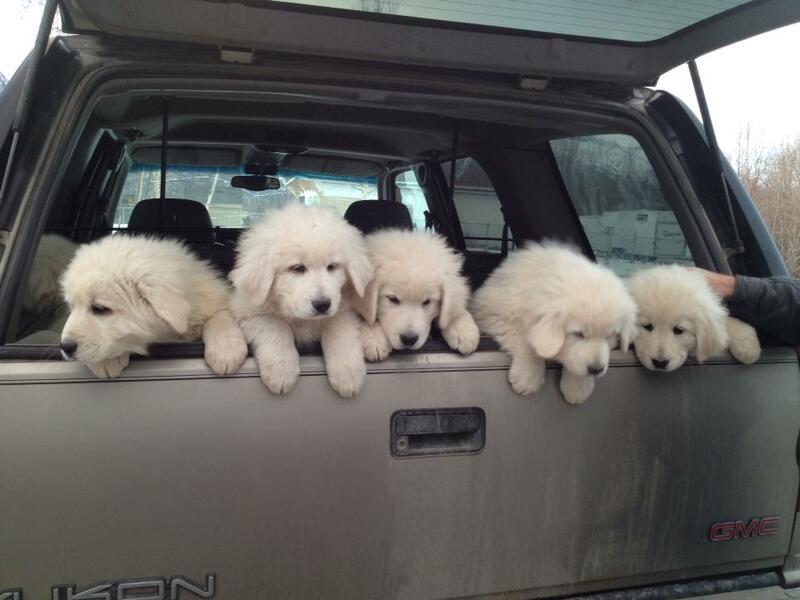 There were 8 pups in the car and we were lucky enough to get a shot of them standing together on the tailgate. At that age they are going a million miles an hour in all different directions. Are you or have you had any pups this year? We are looking for a female pup to go with our pack. You told us to check out your blog for info.